As a student on the Weekend retreat you will participate in a living process which gives you the opportunity to discover new dimensions in yourself. The retreat is a process in which all aspects are equally important. Only participate on the retreat if you are prepared to follow the whole retreat. Everybody is welcome to join the retreat as it is designed for both the beginner and the more advance student. We work step by step. By using your body in different yoga exercises and poses, you will rediscover it. You will develop more sensitivity towards your body, alleviate tension, build-up energy and gain well-being. Your breathing reflects your state of mind, whether you are calm, impatient, groggy, nervous, restless, etc. With the breathing exercises you can transform any state and gain contact with your inner surplus energy, the psychic energy. Yoga teaches you to find the balance between being active and resting. You will learn how to be more at peace with yourself while being active and more attentive while relaxing. 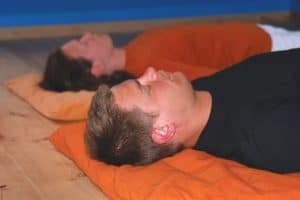 On the course you will learn simple relaxation techniques for use in daily life, and also Yoga Nidra – a thorough, deep going relaxation technique. Yoga Nidra is among other things a method for exploring the borderline between consciousness and unconsciousness. You will become more aware of – and learn to relax – the different dimensions in your being. By doing this you will rediscover the ability to rest in yourselves. You will also learn how to make a resolution which you can rely on. You discover and stabilise your attention and ability to stay alert, both in actions and while going into deeper contact with your inner life. You will learn two different meditation techniques on the Weekend Retreat: The Source of Energy and Inner Silence. The Source of Energy meditation cleases and clear up in in the body and mind by using a peculiar breathing technique and concentration on the chakras. Energy stored in tensions and an unclear state of mind are realeased and transformed into a state of resting calm and spaciousness. Inner Silence meditation begins with a fundamental training of your awareness. You learn to accept disturbances and thoughts. By doing that your mind will calmed down making it possible to be more creative. The essence of Inner Silence meditation is a transforming experience of the silence from where we experience everything else – that of being one with oneself. In the evenings we have classes with talks and Satsang: «Confrontation, accept and change», «Yoga in daily life» are examples of themes. Some evenings we practice Sufi-dance or Kirtan, a kind of singing-meditation. One or two times we will have Sauna with bathing in the sea. You learn a lot on the course – but not everything takes place in the yoga hall. Your body must be able to transform the energy you acquire from the practices. An important experience in the process is your participation in the tasks around the Course Centre: in the garden; preparing food; dish washing and cleaning or perhaps doing repairs on a house og moving some stones. Socially speaking, Karma Yoga (as these activities are called) implies that you do things for others, together with others and that you don’t expect to be waited on. After all, you have not come to a holiday resort, but to a retreat with people who want to work with themselves. Naturally you will want to be better able to deal with the tasks and challenges awaiting you at home. Activity creates stamina and drive. Many have discovered this secret on our courses. Without Karma Yoga it would be impossible to run such comprehensive courses. The course offers many paths to reach deeper states. The expected results, however, would not be achieved in a harmonious way without outwardly directed activities and common tasks. When you let go of something and also give something, then you are more able to receive. The energy is transformed; it becomes available to you. Karma Yoga is an activity that balances the whole course and contributes to the increase in your wellbeing. Karma Yoga is part of the program for 1-1½ hours a day. In addition each person helps 2-4 times (depending on the number of students) cleaning and dishwashing after lunch and dinner. 4.30 – 5.30 pm Short yoga program, breathing exercises etc. Bjarke Jørgensen and Audhild Naustdal. Location of the retreat: Ask Retreat Centre, a beautiful setting by the sea on the island of Askøy, 2 miles north of the capital of Bergen. Accommodation in single or double room in the main Log House, the Log Cabin, the Boathouse, the Alcove or the Sea View Apartment. 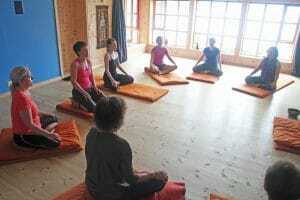 We will do Yoga and meditation in the Yoga room or in the Pyramide. Please also read the page regarding Practical Information and how to get here. Cancelling your booking: Cancellation must be done in writing either per mail or email. When cancelling later than 1 month before the course you will have to pay NOK 625. Later than 14 days NOK 1.000 and later than 1 week before NOK 1.500. If you cancel the booking after the start of the retreat you will have to pay full price. Cancellation due to illness: Attach medical certificate or doctors statement which verifies your illness, and you don’t have to pay for the retreat. You are required to attend all classes / activities at the scheduled times – willingly come 5 minuttes before the agreed time! Do not smoke on the school’s premises. If you must smoke, then take a walk alone. During a retreat, you take a break from your usual influences and impressions. You retire for a period to gain an overview and get some peace to do what you have come for: to work with yourself. During a retreat, you will not read newspapers, watch TV, use your cell phone for talking or SMS or receive visits. Leave your mobile telephone, computer and anything similar at home or turn it off during your stay. Inform your family and friends that it is not possible to contact you during the retreat. If an emergency arises in your family they can contact you by phoning the retreat centre at phone +47 56 15 15 00. …to come with you on the course, not even your partner, unless they themselves are completely motivated to participate. Come for your own sake. Come because you want to discover and work with yourself. is only for students which have participated in a Weekend Retreat for beginners, either at Ask Retreat Centre or similar. The Classical Yoga program and breathing exercises are emphercised and the meditations are devoloped with new steps. Karma Yoga, Kirtan and Mauna (stillness) are introduced in theory and practice. Karma yoga is just like on the beginners Weekend Retreat and in addition there will be Satsang (talk / lecture) about working with one self. Mauna (Silence) from Saturday 10:45 a.m. to Sunday 1 p.m.
Not a word about sweat and effort; with yoga it is a question of well-being built on other principles. Even though the «small wind and tension releasing exercises» is the first programme you meet on our courses, it is not just for beginners, it has also a deeper effect. Pawanmuktasana, as it is also called, is viewed from a knowledge of the vital energy, known as prana in India and Chi in China. The yogic breathing exercises have a thorough and precise effect. The doctor was nervous: Is there a lack of oxygen when I do breathing exercises and hold the breath? So he investigated the matter. This provides more oxygen to the blood, strengthens the immune system, and is also beneficial for the heart. An improved balance in the brain makes you clear, optimistic and extrovert. A short introduction to Yoga Nidra. A new chapter in research on meditation, it was called, when the scientists published pictures of yoga teachers doing Yoga Nidra. The research was done with one of modern medicine’s most advanced instruments – the PET scanner at The State University Hospital in Copenhagen. Swami Janakananda writes for the first time about the knowledge and methods in Tantra which lie behind Tantric rituals and which make Yoga Nidra so uniquely effective and deep – about Nyasa, Chakras, consciousness and the resolution in Yoga Nidra. Did we have a living meditation tradition in the North? Did grandmother meditate? Maybe, without knowing it was meditation – she called it something else. An article about the Tantric meditation Antar Mauna (Inner Silence) – and its ancestors and cousins. A pearl of a meditation – the most basic and advanced at the same time. It opens with methods that make you independent in relation to influences – inner as well as outer. «Say the troll’s name, and it disappears», goes the old fairy tale. The teacher’s foremost task is to awaken the student into being able to experience – perhaps the most releasing and curative ability we possess. Using meditation over a longer period of time can have an enduring beneficial effect on your brain activity. One who meditates regularly experiences a lasting relaxing effect in daily life. Energy is more than a discovery in our technical age. «Prana», «Ki», «Mana» – the psycic energy has been known through all times. Now it is being discovered by us. Times: The Weekend Retreat starts Friday evening at 6.30 pm. and ends Sunday at 4.30 pm. The retreat is intensive – but you still have time to enjoy the countryside, go for a walk, reading, etc. Bring with you: Comfortable loose clothes for yoga, bedclothes, water proof and solid footwear. The Weekend costs NOK 3.600. This includes teaching, board (vegetarian food) & lodging. Single room can be booked at an additional cost of NOK 336 per night. As there is a limited number (and they get booked early) please contact us per email for further information.